ADA compliant aluminum modular wheelchair ramp system - online catalog. This modular aluminum ramp system is strong, durable, portable, flexible, and affordable to make it the best alternative to provide quality, functional wheelchair access to many areas. This ADA handicap ramp system will meet all building codes including the Texas Accessibility Standards and can be used for residential and commercial applications. 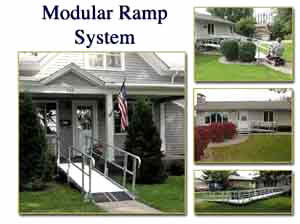 The ramp system consists of standard components that can be assembled quick and easy. The modular components make it easy to move the ramp to a new location or change the configuration. Straight ramps, 90 degree turns, and 180 degree switch-backs are available and designed to meet ADA recommendations. Standard handrails consist of two 1-1/2" diameter horizontal rails. 1:12 Ratio is recommended and required to meet ADA specifications. For every inch of rise (height) you need a foot of ramp run (length). 2:12 Ratio for residential use by occupied chairs with assistance. For every 2 inch of rise (height) you need a foot of ramp run (length). 3:12 Ratio for unoccupied chairs. For every 3 inch of rise (height) you need a foot of ramp run (length). Modular ramps are available in a wide variety of sizes and configurations, note that the prices below include handrails. When ordering multiple items please contact us for shipping discount.